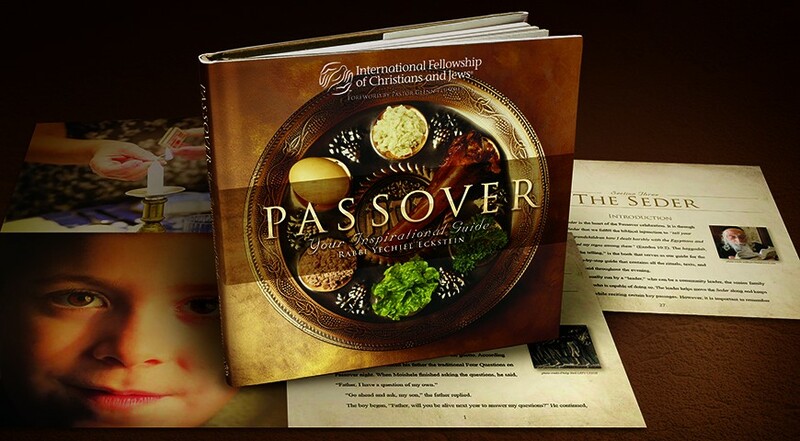 Passover – Your Inspirational Guide, which was written by IFCJ founder Rabbi Yechiel Eckstein, is the fourth gift book that Design Corps has designed for the International Fellowship of Christians and Jews (IFCJ). The earlier books are Holy Days of Israel, Holy Land Reflections and Holy Songs of Israel which each focus on broader aspects of Jewish history, life, or culture. In this latest book, however, the goal was to give more in depth explanations for core aspects of Jewish faith and practice. Design Corps was responsible for the design of the cover and the interior, for page composition, as well as for image selection and refinement. After the completion of the book the last section was reformatted as a saddle-stitched booklet to be used as a marketing tool. While the first three Holy books formed a sort of trilogy, Passover required a different layout and style. First, dust jacket design for Passover was done by Design Corps. We sought to maintain continuity with the first trilogy of books through consistent type and photo styles, but the layout was changed to convey a break from earlier books. Along with a dust jacket, art was provided for foil stamping of the hard cover. We also provided forward thinking arrangements for future design guidelines if other books were to be developed as part of a new series. We gave guidelines for both the elements of corporate branding that would be maintained in all books by IFCJ, as well as guidelines for distinguishing the possible new series from the original trilogy of books. Secondly, the interior design for Passover was done by Design Corps. It included templates for section introduction spreads as well as regular spreads. After approval, page composition was begun. The manuscript included four sections: the history of Passover, the preparation of the Seder, the practice of the days of Passover, and a devotional guide.